"I never cared for beets until I tried them like this. Others who think beets taste too earthy also enjoy them prepared this way." 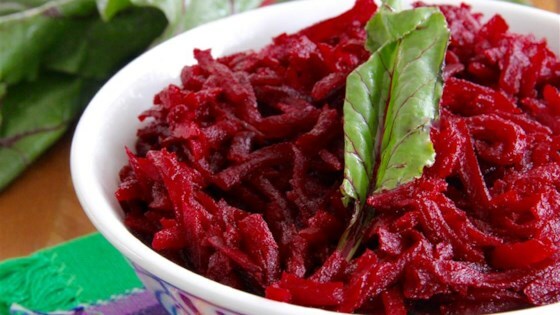 Shred beets in a food processor. Melt butter in a skillet over medium heat. Cook and stir shredded beets in hot butter until slightly softened, about 5 minutes. Pour water over the beets, cover skillet with a lid, and simmer beets until completely softened, about 10 minutes. Stir balsamic vinegar with the beets; season with salt and pepper. Needed a new recipe for beets. Turned out really delicious. Will definitely make this again. I will use this recipe again and again. So tasty. Easy and tasty. Simple flavors make and excellent side. Easy with the food processor. Made it exactly as the recipe directed. Good and easy!